The City Museum’s Costume Collection offers a unique lens not just on New York’s history and aesthetics, but its personalities, too. Our most fascinating acquisitions come from those who’ve lived in the city’s spotlight. And from my perspective, the most memorable figures share in one trait: they were beyond passionate about their clothing. Occasionally, we can trace a garment back to its owner just through looking at the line, color, finishing techniques, plus the unmistakable evidence of scale and proportion. A seasoned curatorial sleuth can assimilate this physical evidence and write the script as to how a garment fit into the life of its suspected wearer. 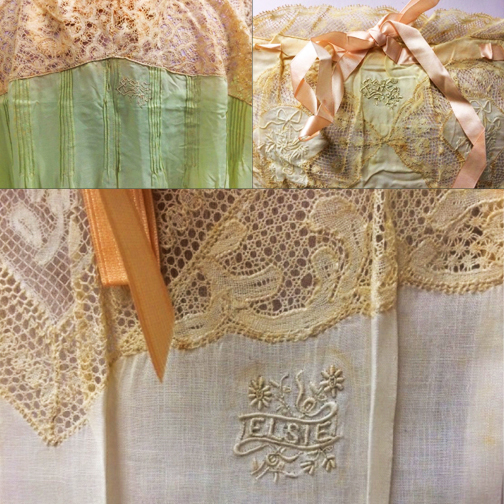 Recently, my colleagues and I solved an ongoing quest to identify the elusive “Elsie,” whose trove of breathtaking trousseau lingerie resided without attribution for decades within collection storage. (There are at least three Elsies whose fashions we know from our Gilded Age collections.) 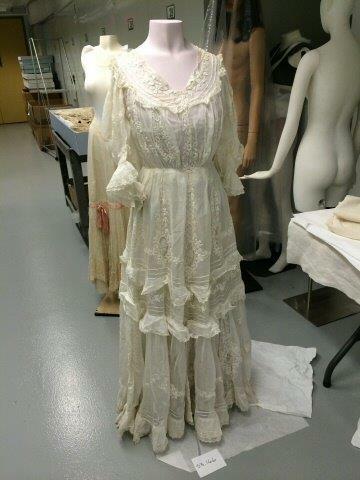 The puzzle pieces came together as we fitted a lavish 1906 white cotton mull dress on a period-silhouetted mannequin. Physical clues led us to Elsie Whelen (1880-1959), daughter of Philadelphia banker Henry Whelen, who was described in the New York Times as being “…six feet tall and of marked beauty of face and person…” A popular debutante, Elsie walked down the aisle with Harvard graduate and future financier Robert Walton Goelet on June 14, 1904. She wore a bridal gown of lace over white chiffon and taffeta silk, its long train trimmed with swansdown. From examining her ravishing portrait in the 1904 “American Book of Beauty,” one can see she was the consummate Gilded Age trophy wife. As Mrs. Goelet, Elsie traveled to Japan, China, Scotland, Rome and Paris, assembling an enviable wardrobe produced by the finest couture hands and purveyors of the day. Among her acquisitions was a “summer white” dress, ultra-feminine in design, amplified by its accommodations to her surprising height. A few years later, Elsie met Paris’s sultan of exoticism, couture innovator Paul Poiret. Poiret found her an obvious muse; her elongated hanger-like body reiterated the slim, sinuous lines of his designs. Under his influence, she assumed a far more daring fashion personality. 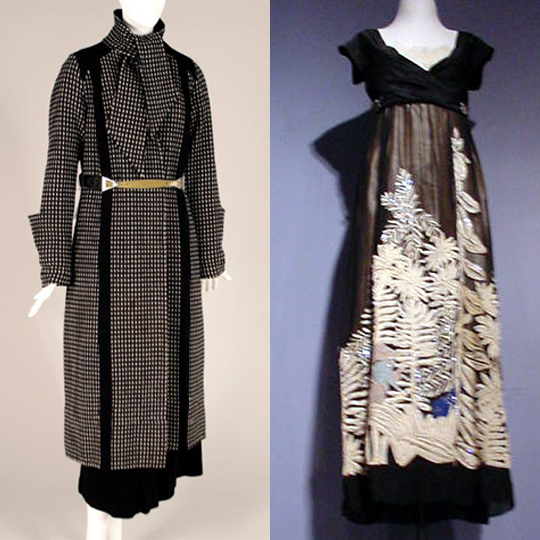 During this era, Poiret designed for her a pearl-encrusted evening gown that he entitled “Homage à Rousseau” (ca. 1910) and a fuchsia silk opera wrap (1912). Both reside within our collection. Elsie continued to drift from her life as Mrs. Robert Goelet. 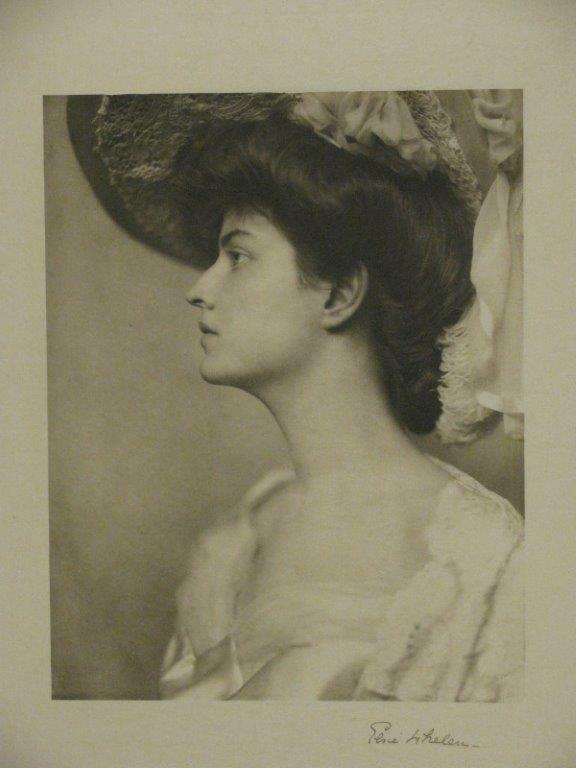 In January 1914, she divorced her husband, captivating the press and public’s imagination. By December of the same year, she married Henry Clews, Jr., a marine painter and sculptor she had fallen instantly in love with upon meeting him at a Newport dog show. Throughout these proceedings, she remained a devoted Poiret client. The Costume Collection boasts 14 striking Poiret garments made for Elsie some years later, though she had changed her name to Marie Clews – rechristened by her new husband. The garments, dating from 1919 to 1930, attest to the perennial fashion flair of their wearer. Elsie’s trousseau lingerie was embroidered with her name on the bodice, in various fonts and stylizations. Return to our present-day dilemma of the unattributed trousseau lingerie. During routine collection maintenance some two years ago, we encountered a 20th century suite of nightgowns, gorgeous camisoles with matching split drawers, corset covers and petticoats, all embroidered with the name Elsie in various stylizations. Of the 22 items, none had been assigned the accession number routinely given to objects as they attain formal status and enter the collection. Suddenly, the mystery made complete sense: who else from that early 20th century period might have possessed and donated such impeccable underpinnings? An immediate search of our records revealed that yes, a large body of trousseau lingerie custom-made in Paris by Mme. Lavail had entered the Costume Collection as a 1952 gift from Mrs. Henry Clews. Compared with the generous endowment of Poirets that spread over the following six years, the lingerie had not been considered important enough to assign formal status. Today, knowing the full story of our Gilded Age heroine, we beg to differ. Phyllis Magidson is the Museum of the City of New York's Curator of Costumes & Textiles. Good work in the Nancy Drew department, Phyllis! What an interesting story about an interesting lady. Thanks for sharing. This entry was posted on November 5, 2014 by Phyllis Magidson in Costumes and Textiles, Uncategorized.